As hard as it tries to brand itself as such, Aol isn’t known for innovation. Part of the co-editor job here at TechCrunch is fending off some of the clunky things that our parent company does, like holding an internal Aol Disrupt, or playing a Taylor Swift parody during all hands or making us log into our TechCrunch emails with our Aol accounts. This is why what Ryan Block and Peter Rojas are doing at Aol Alpha is a big deal. They and their 20-person team have managed, much like we’ve tried to at TechCrunch, to gain as much independence as possible within our corporate borg. And they’re using it to make cool, mobile-first apps. This injection of independence benefits Aol in the long-term, as it fosters an environment that can produce surprises, the newness Aol desperately craves. 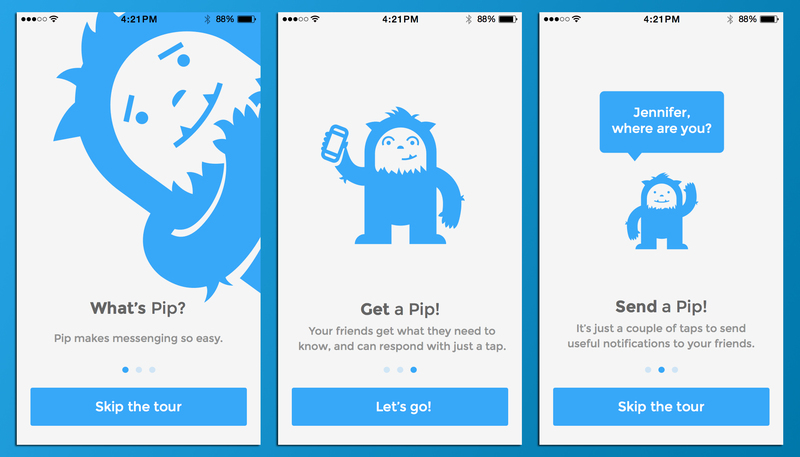 Pip, a structured messaging app, is the first launch in the Alpha series, and like Yo, it allows you to send a specific message to your friends on the app. Unlike Yo, however, the Pip messages actually have utility, like telling someone you’re running late or that it’s raining. 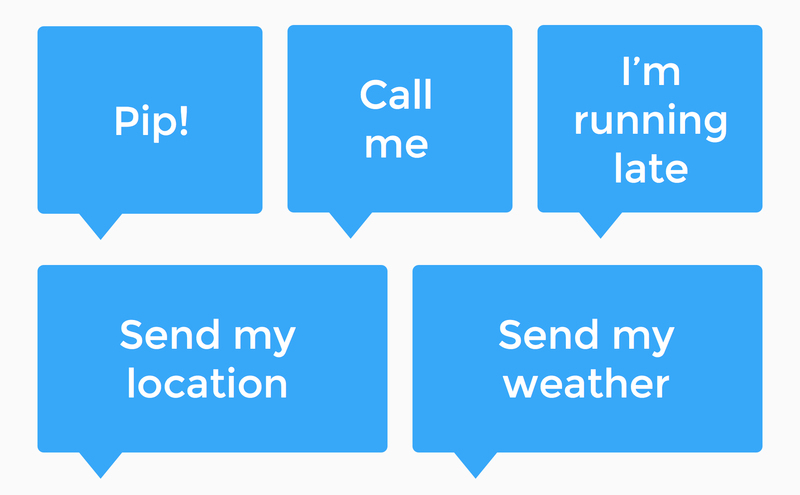 The specific messages you can send through Pip are “Call me,” “I’m running late” (with specific time intervals), “Did you do that thing?,” “Where are you?” and your weather and location. 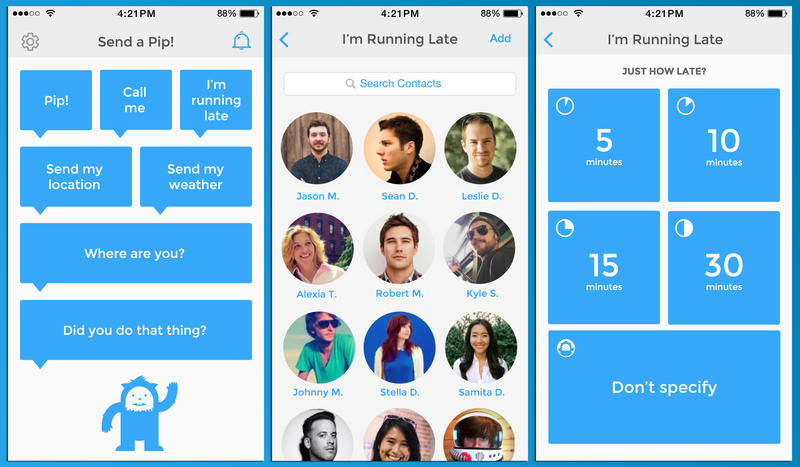 Users can respond with another set of structured messages. Because the person you send a Pip to, and the time you send it, function as context, the specific messages become vehicles for multiple meanings. I’ve sent a couple of very pointed “Did you do that thing?” Pips, for example. Sure it’s a simple idea, but when you consider that Pipping an “I’m running late” from your Apple Watch (once it launches in 2015) will be the fastest way you can get the information across, it starts to make sense. “We’re adding additional utility to the push notification. Getting a Pip is better for the recipient than just getting a similar text message. We are also turning stuff you might not normally send as a message — like your location or the weather — into something you can much more easily share with your friend,” Rojas said. Pip makes even more sense when you consider Aol’s rich messaging past, and the missed opportunity it had with Aol Instant Messenger– which many of us at some time used religiously but now have replaced with iMessage, Facebook Messenger, WhatsApp, Skype, Snapchat or one of the other thousand avenues presently available for messaging. Evan Williams has even cited the status part of AIM as a primary inspiration for Twitter, a constant stream of statuses. “Messaging is an area where Aol has a long history and we thought it made sense to try and build something in that space, especially if we could make it mobile-first,” Rojas said. Engadget founders Rojas and Block came to Aol for the second time through the Gdgt acquisition and will have spent two years here as of February 2015. As a testament to Alpha’s independence, Block and Rojas did not use Aol MapQuest to build out the locations on the app, preferring to use the Foursquare points of interest graph instead (they did end up using Aol Weather). Their next app, which you can see a preview of on the Alpha homepage, is called Starlike and it uses your Twitter faves for news reading. And they’re managing expectations. Now if only Aol would let us use Pip for our work email. Disclosure: I both work at Aol and own Aol stock.